John H.F. and Elise K.A. (Wahlfeld) Behmann and their two sons, Herman W. and Arno W., began the journey to Corpus Christi, Texas from Petersburg, Illinois traveling through Pauls Valley, Indian Territory, now the state of Oklahoma, arriving in Corpus Christi on April 5, 1907. Shortly after moving to Corpus Christi, John and Elise Behmann opened the Wahlfeld Grocery on the corner of Waco and Leopard streets. Later they moved the business to the corner of South Staples at Laredo Street and changed its’ name to Behmann Brothers Grocery. The Behmann Family was in the grocery business from 1907 to 1946. During this period, they acquired farm land in the Corpus Christi area and began leasing the property to farmers. 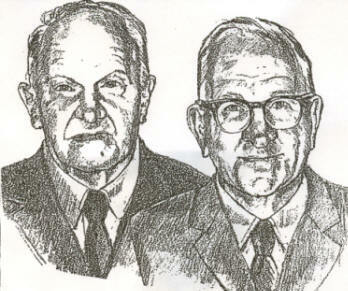 Herman and Arno began making loans to farmers and local homeowners. When one of their borrowers ran into financial hardship, the brothers would work with them and never foreclose. John H.F. Behmann passed away in 1926 at the age of 55; Elise K.A. Behmann passed away in 1956 at the age of 84. Herman died in 1979 at the age of 83. In that same year, Charles L. Kosarek, Sr. helped Arno establish the Behmann Brothers Foundation. Arno passed away in 1988 at the age of 90. With its inception, Charles, Sr. became President and ran the Foundation until his death in 1994. His son, Charles L. Kosarek, Jr., then Vice-President, took over the President’s position and is still managing it today. The Behmann Brothers Foundation’s motto is “For the Good of the People”. The Foundation focuses its charitable contributions primarily in the areas of agricultural research and education, youth groups, healthcare, and service organizations.